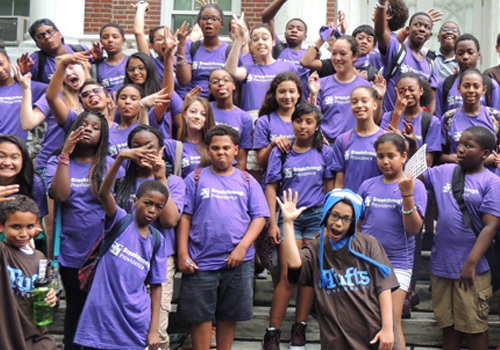 Break Through to College is a six-year program which provides rigorous and culturally relevant academic enrichment and leadership development during critical out-of-school times to low-income, first generation college-bound Providence public school students. Break Through to College leverages the relational power of near-peers to serve as teachers, tutors, mentors, and advisors through a “students teaching students” model. Apply to be a student. 73% of Breakthrough Providence students immediately enroll in a 2-year or 4-year college after graduating from high school. This is compared to 58% of all low-income high school graduates in the U.S.
61% of Breakthrough Providence students immediately enroll in a 4-year college after graduating from high school. This is compared to 44% of all high school graduates in the U.S.
72% of Breakthrough Providence students enrolled in a 4-year college persist to their junior year. This is compared to 55% of all first generation college freshmen in the U.S.
72% of Breakthrough Providence students graduate from a 4-year college within 6 years. This is compared to 51% of all low-income high school students in the U.S.